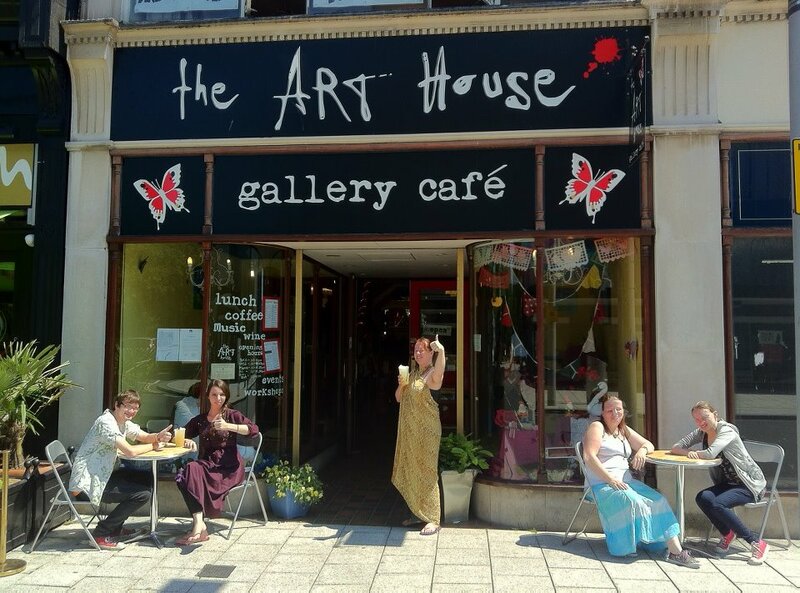 If you’ve never been to visit, you may wonder what it’s like to come to The Art House. At different times of day, the space can feel a variety of ways – sometimes chilled out and quiet, sometimes lively and full of activity. When you walk through the door, you will be surrounded by things that are handmade. Everything here has been made, chosen and finished with love, mostly by volunteers. From the bright red front door (Tony painted that) to the teapots coming out of the ceiling upstairs, it’s all arrived here quite organically (a lot like the food!). You will be welcomed by a volunteer, usually whoever is on the till, or one of our paid co-ordinators. There are menus, which you can take away with you, on all the tables and you place your order at the counter. You can pay when you order or, if you are hanging around for a while, open a tab. You can sit downstairs in the main cafe, or in the windows watching the world go by, or find a quiet spot or larger table upstairs. Unlike other places, we don’t cram people in – there’s a different sort of space depending on what mood you’re in. If you’re in alone with your sketchbook, notebook or journal, you can find a corner in the gallery or grove upstairs, maybe even a sofa, where you can create undisturbed. If you’re a freelancer or a student trying to get some coursework done, you can use our Wifi and spread your notes out on one of the bigger tables. Perhaps you’re coming in with a partner? Our sofa is great for snuggles and sharing a slice of chocolate cake (we’ll even give you two forks!). There’s spaces for bigger groups of friends or meetings, too. You can even hire the space for your own meeting or event. 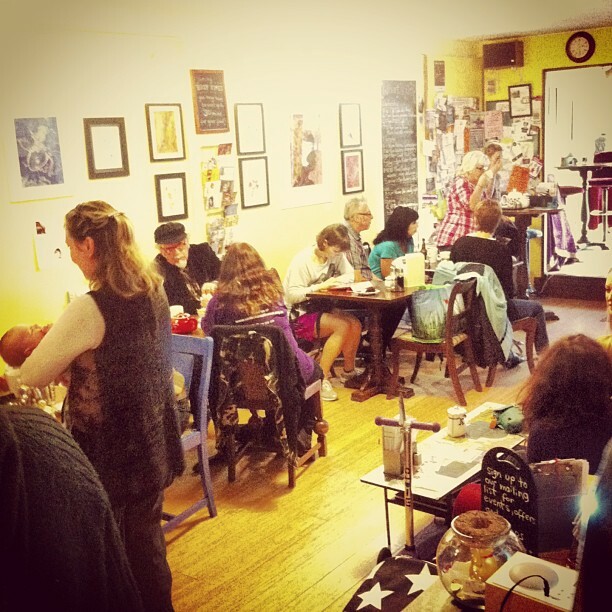 Of course, in the evenings there is often a completely different vibe: a supper club, a live music event, comedy or poetry. We are licensed to serve alcoholic drinks, so you can even enjoy some wine, cider, a locally made ale or a nice gin and tonic. 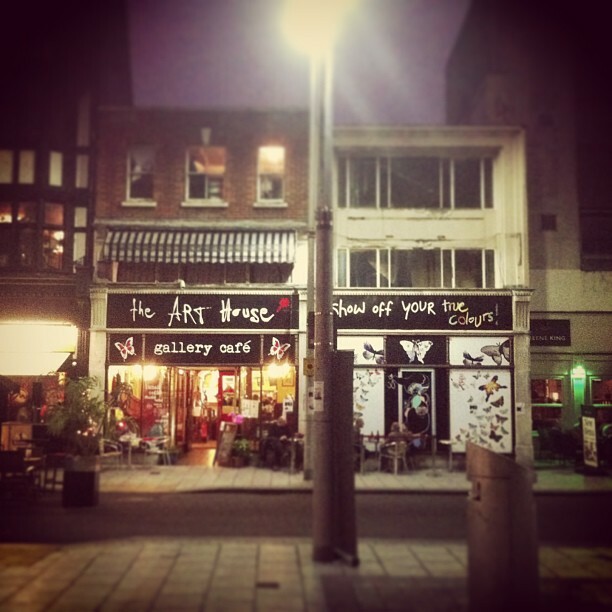 The Art House is open late Wednesdays – Saturdays, so that you can enjoy that cafe vibe in the evenings, too. A cafe can be so many things: A home from home, a place to connect, a place to escape the bustle, a place to be around people or a place to enjoy your own company. Here at The Art House, we are happy to provide what you need, on any particular day.